We are headed out for an off the beaten path adventure in search of killer whales in the fjords, off the island of Skjervoy, Norway. We have decided to go in November, since this is the heart of the herring season. Large quantities of herring migrate into the fjords for their wintering grounds. Herring shoals are followed by hundreds of orcas and humpback whales, that migrate through each winter season to hunt the herring. This is why we are headed out there and we are inviting you to join us. 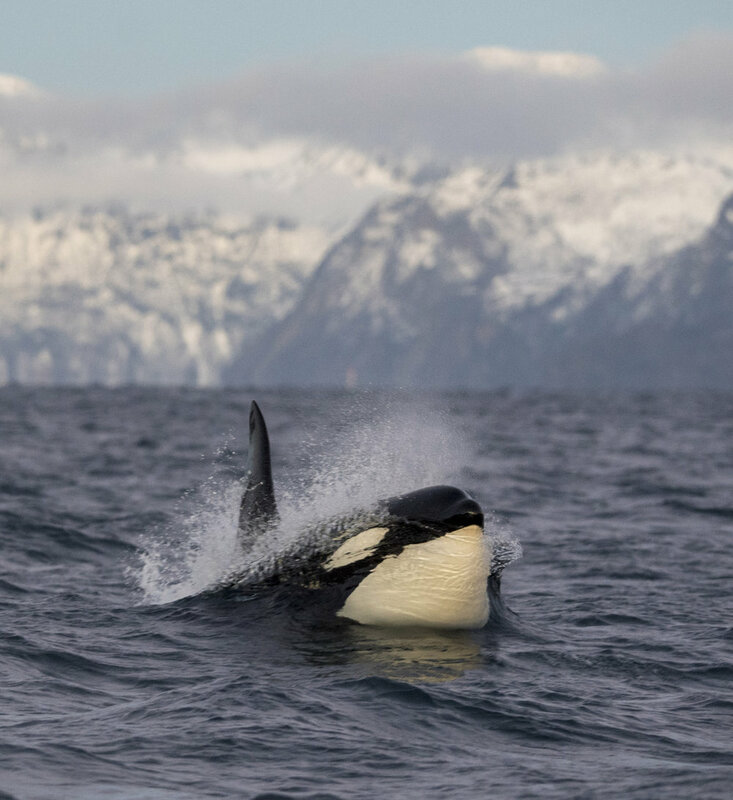 This is a rare and special opportunity to swim with (or simply observe from the boat), orcas while they are hunting the herring in the food rich waters off Skjervoy. A vlog from our 2016 Arctic orcas expedition. The opportunities we are looking for; when the orcas are feeding on the herring. The orcas corral the herring into bait balls, and drive them up to the surface to trap them. This is when we have the best chances of long, up close encounters. Once the herring is trapped, they will stay in one spot, slamming into the baitballs, allowing us to witness this extraordinary dance, of hunting orcas. On our first trip out here in 2016 we had two days, where we spent over an hour in the water with a pod of 11 orcas actively feeding on a baitball. Our entire time at sea will be spent searching for those opportunities. When the orcas are hunting, they are swimming fast, chasing the herring, which makes encounters with them impossible. Depending on their mood, the orcas may feel social and will come up to our boat for a quick inspection. On those days, If we have not found a baitball, then we may try and slip in with them for a quick few seconds to see them as they swim by. On the days they do not feel social, we will follow them around, watch them from the surface, until they hopefully round up a baitball to feed on. Part of this adventure is of course to experience and photograph one of nature's great natural phenomenons; the "Aurora borealis." 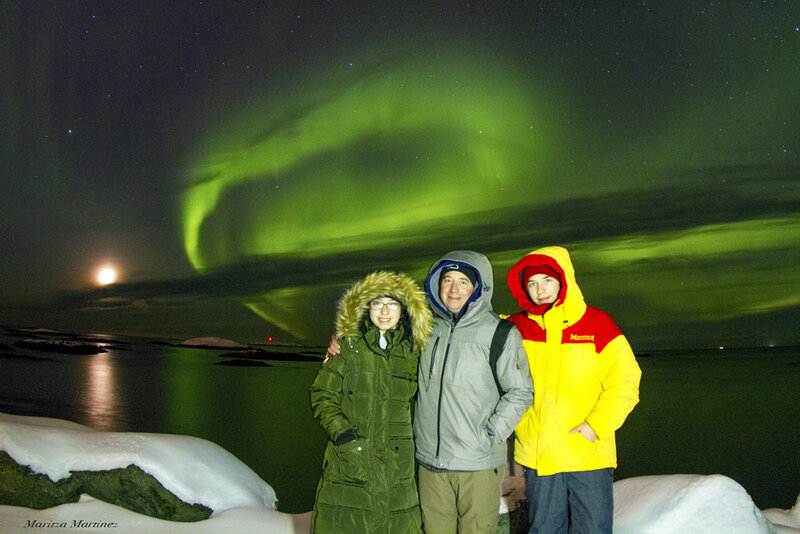 Auroral displays appear in many colors, although pale green and pink are the most common.The lights appear in many forms from patches or scattered clouds of light, to streamers, arcs, rippling curtains or shooting rays that light up the sky with an eerie glow. In the evening, we will set out to find the best spots for a chance to photograph these lights. Each evening, if the skies are clear, we will go out in search of these lights. *If you are interested in learning how to photograph the lights, your trip leader Eli Martinez, will help you to choose the right settings on your cameras, to ensure, each of you go home with images and memories of this amazing light show. Diving with orcas is truly a humbling experience and Norway is one of the only places on the planet where swimming with these amazing animals is reliable and still legally allowed. These are day trips. Each morning we will head out on our fast boats in search of the orcas, and after our hours spent at sea, we will return to port where you can return to your hotel room to warm up, review the days images, relax or explore the beautiful rural island of Skjervoy. These are wild animal encounters and there is a possibility that we may not see any animals. However we are using some of the best in the business to help us find these animals and our trip is scheduled during the heart of the herring season (plus with the help of the local fishermen and whale watching boats) we feel extremely confident we will find them for you. So if your interested in swimming with orcas in some stunning landscape ... join us! Day 1 Arrival day. We will pick you up from the Tromso (TOS), airport and transfer you to Skjervoy Island, via. private van and ferry. Total travel time is 3 1/2 hours. Once we are on the island, we will drop you off at the hotel. The rest of the day is yours to prep cameras, dive gear and explore the town. Day 2 - 6 (5 days) In the morning we have a good breakfast, then head out to search for the orcas hunting herring. When we return to port, we will break for lunch. After you can go back to your hotel to warm up and review the days footage. Dinner will be served in the early evening. In the late evening, if the skies are clear we will head out into the darkness, to search for the Northern Lights. Day 7 Eat a good breakfast. Then we will begin the journey back to Tromso airport, for your journey home. *** Please note; THIS IS THE ARCTIC, and this trips core focus is swimming encounters with large predatory animals in some of the most extreme ocean conditions in the world. These trips are not for everyone. So please know when you choose this adventure. Water Temperatures average, 32 - 40 F (0 - 4 C). Thank you for your interest in our Arctic Orca Expedition. We will send you more information on this trip. If you have any immediate questions, regarding the expedition, please feel free to call us, or send us an email.